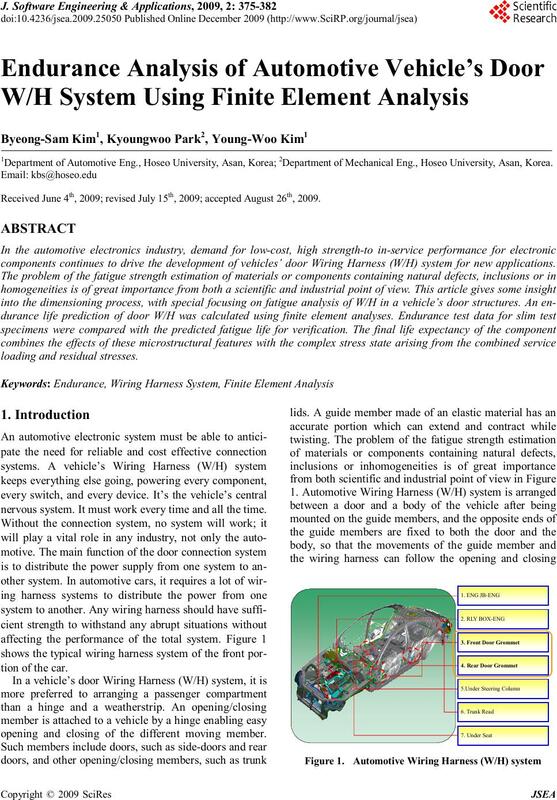 1Department of Automotive Eng., Hoseo University, Asan, Korea; 2Department of Mechanical Eng., Hoseo University, Asan, Korea. Received June 4th, 2009; revised July 15th, 2009; accepted August 26th, 2009.
components continues to drive the development of vehicles’ door Wiring Harness (W/H) system for new applications. nervous system. It must work every time and all the time. opening and closing of the different moving member. 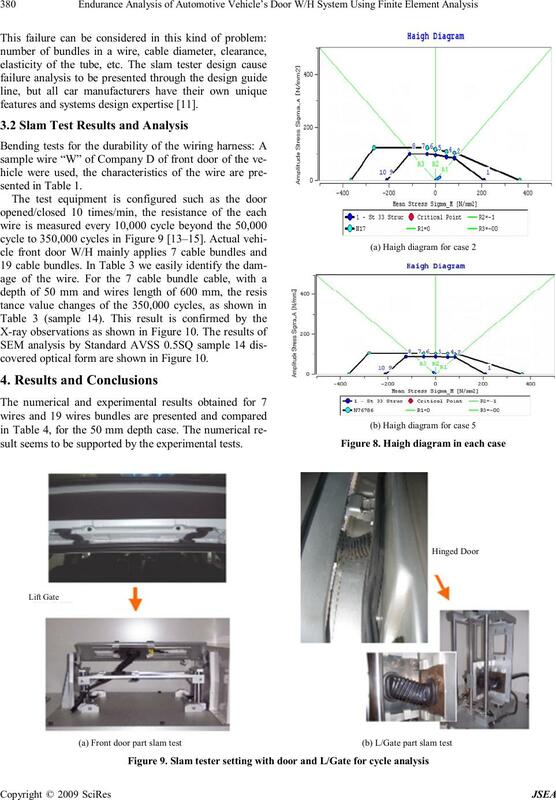 analyses and slim tester (Figure 2). 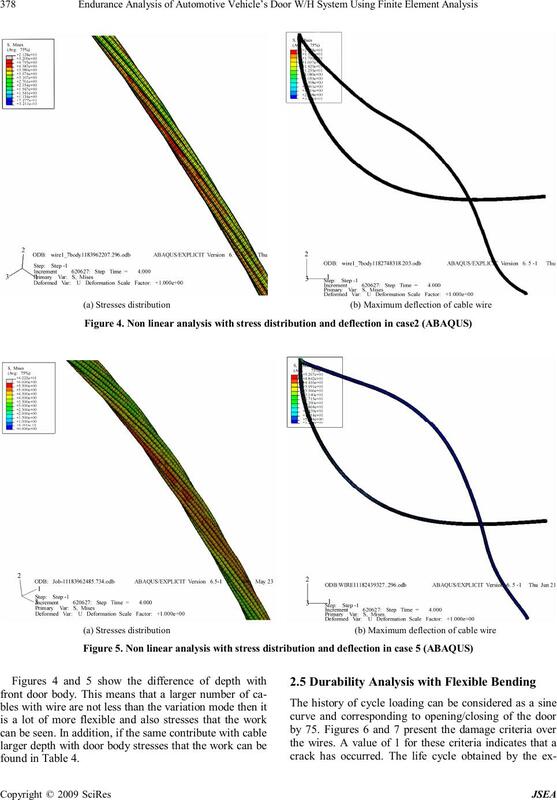 within acceptable fatigue and durability parameters. non linear analysis on an IBM A-Pro(dual CPU 2GHz). (“lumped”) element mass matrices [7–10]. using the explicit central-difference integration rule . to the increment number in an explicit dynamics step. ciency associated with the explicit dynamics procedure. 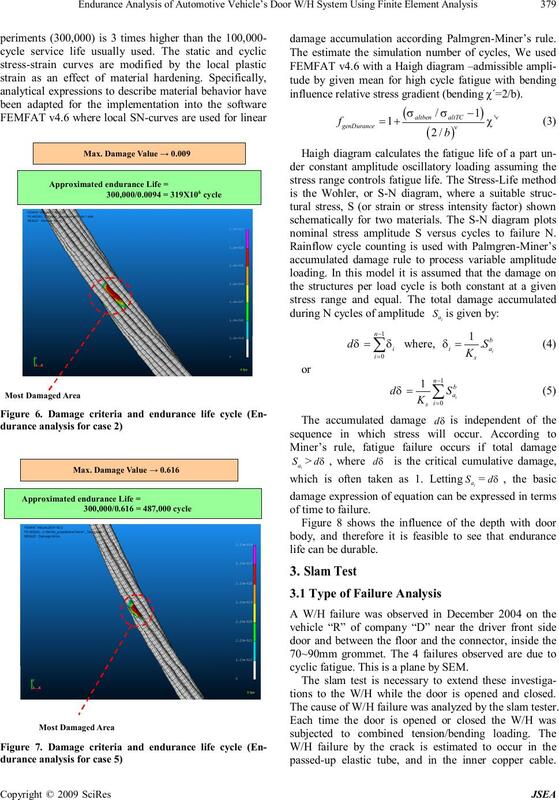 damage accumulation according Palmgren-Miner’s rule. influence relative stress gradient (bending χ´=2/b). 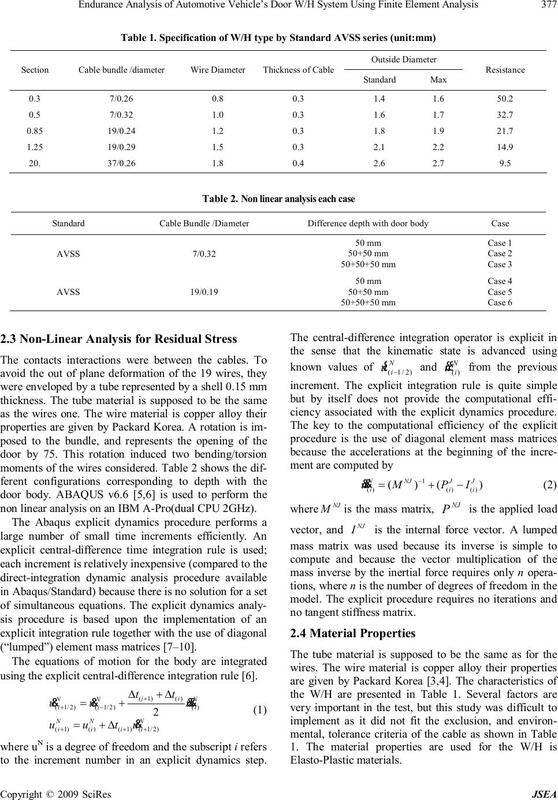 nominal stress amplitude S versus cycles to failure N.
cyclic fatigue. This is a plane by SEM. tions to the W/H while the door is opened and closed. 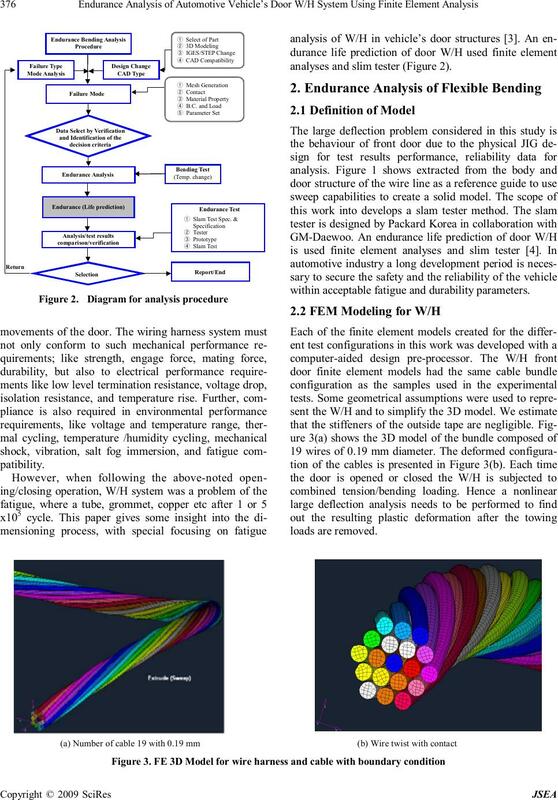 The cause of W/H failure was analyzed by the slam tester. passed-up elastic tube, and in the inner copper cable. features and systems design expertise . 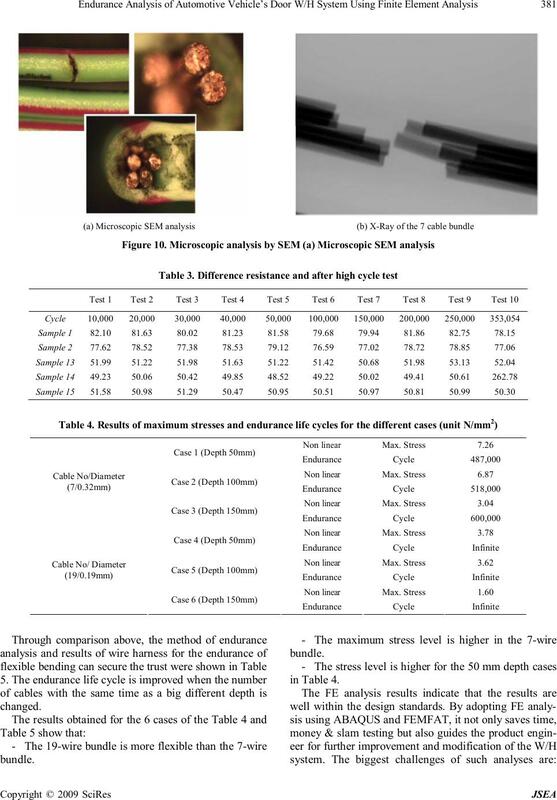 covered optical form are shown in Figure 10.
sult seems to be supported by the experimental tests. rive prototype, the following useful results were obtained. for the endurance life efficiency. nal report, Warren, Ohio, 1990.
report of Hoseo University, 2007. Vol. 1, pp. 345–357, 2006.
numerical methods in engineering, Vol. 23, No. 2, pp. 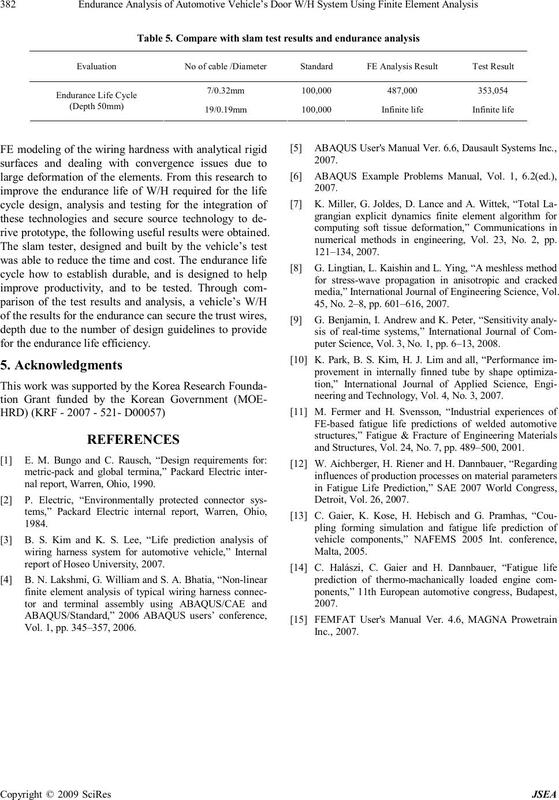 media,” International Journal of Engineering Science, Vol. 45, No. 2–8, pp. 601–616, 2007.
puter Science, Vol. 3, No. 1, pp. 6–13, 2008.
neering and Technology, Vol. 4, No. 3, 2007.
and Structures, Vol. 24, No. 7, pp. 489–500, 2001.